You can choose to reboot or shut down the Smoothwall System either immediately, after a time delay, or at a predetermined time. 1. Go to the System > Maintenance > Shutdown page. • immediately — Reboot or shut down the Smoothwall System now. • delay action for — From the drop-down list, choose the length of time to delay the reboot or shutdown. Valid options are given in five minute increments, from five minutes to one hour. • at the following time — From the drop-down lists, choose the time, in 24-hour format, to perform the reboot or shutdown. 3. Click Reboot or Shutdown. 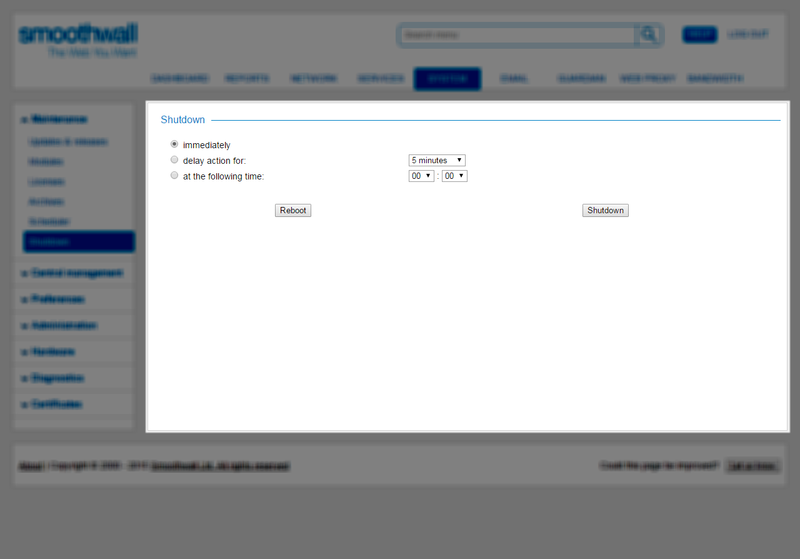 The browser displays the Smoothwall logo whilst the system is rebooting or shutting down. Smoothwall. If a reboot is occurring, this page refreshes to the login prompt once the reboot has completed. If a shutdown is occurring, the page remains until you manually close your browser window.